A silver-plated shoe from Olympic dressage horse Valegro that raised $5000 at auction is just one of the latest contributions to help ill or injured equestrians in the US. Proceeds from the auction of the shoe and other items went to the non-profit Equestrian Aid Foundation, which helps those in the horse world rebuild their lives after catastrophic injury or illness and financial crisis. Since its inception 21 years ago, it has provided more than 2.9 million in needs-based grant support – as well as a promise of hope to horse people of every age, discipline, and profession. 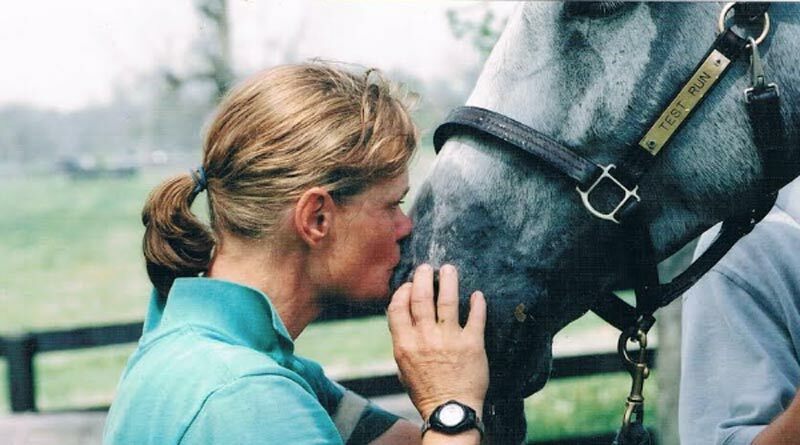 Among those assisted by the organisation over the years are eventer Kim Meier, who was paralysed from the shoulders down in a freak riding accident in 2007. Before that, Meier was on the path to great success, having finished second at Burghley in England, and in the top 10 at the Kentucky Three Day event in 2004. Meier, then 45, carved her career in classic eventer fashion, riding homebreds and doing all the work herself. She developed her work ethic at the summer camp her family owned, fell in love with the horses and was determined to be an eventer. Largely self-taught, she also worked with Denny Emerson, Ralph Hill and Donnan Sharp. Kim Meier and Test Run. Test Run or “Merle” was her ticket to the big time. She had bred his sire and his sire’s dam. But in 2005 he was sidelined with an injury. Then, Meier’s barn endured a frightening and emotional experience with the EHV-1 virus. Merle got through it and they got back to work. “I did three Intermediates that year in the summer and fall, planning my big comeback at Rolex in 2007,” Meier said in an article she wrote for Eventing Nation. As a result of her fall, Meier suffers from paralysis from the C5 vertebra down. Despite extensive rehabilitation, her doctors said she could never ride, stand or walk again and would forever be wheelchair bound. Meier said the Equestrian Aid Foundation “jumped right in to help from the very beginning”, right after she got hurt. The Foundation provided financial assistance to help Meier with basic living expenses. Her daughter and friends help her with daily activities and make certain she has the care she needs. Though it’s been a long, tough road, Meier remains resilient and has the courageous spirit to stay as active as possible. She works judging unrated horse shows when she can, gives some lessons and does the occasional clinic. Another who has benefited from the Equestrian Aid Foundation is Trevor Lent, who made his living as a farrier until the day he was kicked so badly that both his kneecap and femur shattered. After an initial unsuccessful surgery, his doctor performed a total knee replacement that left him temporarily non-weight bearing and permanently unable to return to his livelihood of shoeing horses. Farrier Trevor Lent has rebuilt his life after sustaining a career-ending injury on the job. Without income from his work, the once self-reliant cowboy’s life fell apart. He lost his house and his marriage. For a period of time, a truck and stock trailer served as home to Lent, his horse and his dog. “The Equestrian Aid Foundation was a tremendous help to me during a tumultuous time,” he said. After several years of hard work at odd jobs and with the support of Equestrian Aid Foundation and his friends, Lent bought a small tract of land at the foot of the Datril Mountains in New Mexico. Slowly but steadily, he built a barn for his horse and a shop. He now works repairing tack and leather goods, and he creates custom tack for pack horses and mules. Eventually, he built a small home. Today Lent lives there with his wife Tova, whom he met on horseback. Lent will never be sound again but he, too, is a survivor. Despite the devastating physical, emotional and financial aftermath of his accident, he has rebuilt his life. Donations to the Equestrian Aid Foundation can be made here.